Those words from Hawks head master Joel Quenneville perfectly illustrate where the Blackhawks blue line currently stands: an incomplete entity on a team that has serious aspirations about winning a Stanley Cup this season. To fully grasp that the blue line corps is incomplete, all one needs to do is look up the definition of the word “defend”. Merriam-Webster’s Dictionary defines that word “to attempt to prevent an opponent from scoring at.” This is certainly not what the majority of the Hawks defensemen do well. For instance, Cam Barker and Brian Campbell, who are currently under contract for many millions of dollars, are both known as puck moving defensemen who are great on the power play, and also for moving the puck up the ice for scoring opportunities. These two players are not exactly known for their abilities in actually playing good defense, however. A shining example illustrating this fact was Brian Campbell’s miscue in the neutral zone that cost the Blackhawks Game 2 of the Western Conference Finals against Detroit. 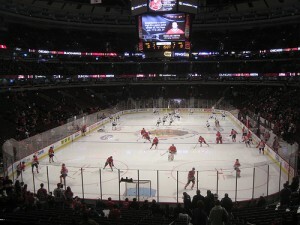 The UC ice, which will see the Hawks debut on Saturday the 19th. When you look at the Hawks’ top defensive pairing, the odds are slightly better to find solid defense. Duncan Keith may be known mostly for his puck-handling and offensive prowess, but he is a gifted defensive player as well. He is especially valuable when the Blackhawks are killing off power plays, with a penchant for clogging passing lanes and firing the puck down the ice at every opportunity. Brent Seabrook also plays the kind of physical defense that a great team is required to execute. His hit against Dan Cleary in the 2009 Winter Classic illustrated not only the power of a moment to capture the essence of a rivalry, but also showed how seriously he takes his craft of being a physical force on the ice. On the third line, however, is where the real issues come into focus. With the departure of Matt Walker via free agency, the Hawks are looking at having three guys competing for the final two spots on defense: Brent Sopel, Niklas Hjalmarsson, and Aaron Johnson. After coming off of an injury plagued 2008-09 season, Sopel will undoubtedly be looking to earn his contract this upcoming year. He is a fairly physical player who exhibits good puck handling skills, an interesting hybrid when healthy that could prove to be quite an asset for the Hawks. Assuming Sopel being healthy, however, is a big mistake that the Hawks certainly will not be making. When it comes to Hjalmarsson, there really isn’t a lot of doubt that he will make the final squad coming out of training camp. He was with the team for most of last season, and had some very fine plays to his credit during the final few months of the season. He certainly will not be mistaken for Walker in the physicality department, but he brings plenty of tenacity and a keen eye for the puck with him whenever he is on the ice. Johnson is the biggest wild card of the bunch. Before injuring his knee last season, Johnson was having a stellar defensive year, ranked in the top 5 of the entire league in plus/minus, and showing that he was maturing as a hockey player. When he returned from injury, however, he saw extremely limited playing time, with Hjalmarsson getting the majority of starts on the blue line. Even with the injury last season, Johnson still finished with a more than respectable +19 on the year, good for fifth on the team. If one were forced to choose right now, Johnson would likely be the odd man out behind a healthy Sopel and Hjalmarsson. The Blackhawks brass however will be keeping a very close eye on Aaron if he should find himself in Rockford however. Now that the guys who will likely be on the roster when training camp opens have been discussed a bit, it’s time to talk about whether or not Quenneville’s wishes will be granted when it comes to getting another blue line player for the upcoming season. GM Stan Bowman does not seem to think that it is necessary for the Hawks to add any more blue line help, but if he decided to trust Q’s judgment on this matter, it would likely be a player of the likes of Patrick Sharp or Dustin Byfuglien who would be the first shipped out of town in a trade. While losing a player of the skill level of Sharp, or the sheer physical force of Byfuglien, would be a damaging blow in the short term, getting a more physical defenseman would not only help the Blackhawks in the defensive department, but also in the salary cap realm as well. With several years remaining on both deals, it would not surprise anyone to see one of these two gentlemen go. Stay tuned. Last year, the Blackhawks had something that they could boast about, albeit sarcastically so: they had the most expensive goalie tandem in the NHL. With Nikolai Khabibulin raking in $6.75 million, and Cristobal Huet taking home about $5.6 million, the two goalies combined to cost the Hawks over $12 million. Considering that the Red Wings compensated Ty Conklin and Chris Osgood about $1.5 million combined last season, it is no wonder why the Hawks decided to let Khabby go at season’s end. That leaves the Blackhawks with Huet as the clear cut starter, and with a position battle brewing for the back-up role between Antti Niemi and Corey Crawford. Starting with Huet, most fans would argue that he had a pretty lackluster season last year. Granted, his play did border on inconsistent, and he was out of position more times than any observer would care to count, but when his numbers are put under scrutiny, a different picture emerges. While Huet did have a pretty poor 20-15-4 year for the Hawks (only earning 44 out of their 104 points), he didn’t have a bad year statistically, notching a 2.53 GAA with a .909 save percentage. He played good in stretches, and likely could have settled into a better groove if he had been the clear cut starter from the word “go”. Instead, Huet split time with Khabibulin, and he tried to cope as best he could. He will be given the reins full time this year, however, and it will be up to him to anchor a shaky defense that needs to prevent goals in order to make it to the next level of the hockey universe. For the back-up job, it will definitely be a two man show in the competition. Crawford has been in the Hawks organization longer, but was glossed over last season in favor of the Finnish product Niemi, who started a few games and was named to the roster to replace an injured Khabibulin. In only three games, Niemi allowed 3.4 goals per contest, and also had a save percentage of .864. While Crawford didn’t sniff NHL ice last season, he still had a solid season at Rockford, going 22-20-3, with two shutouts and a save percentage of .917%. In addition, he was signed to an extension over the summer that would pay him similarly to Niemi, so the job is clearly up for grabs between the two men. In an NHL where a back-up goalie can realistically expect to start between 15-20 games minimum a year, the competition at this key area of the team is going to be heated between the two men.